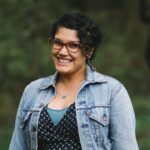 Michelle Rosquillo is an associate director for The Regal House Initiative, and an editor for our Pact Press and Regal House Publishing titles. She is the lead editor for our upcoming Pact Press anthology that focuses upon the impact of human activity upon the ocean environment, and the lead poetry editor engaged in our We 2 R Poets initiative, designed to foster the love of poetry among the elementary students of Wake County’s Title 1 schools. She received her MFA in Creative Writing from The University of North Carolina at Greensboro. With a focus in poetry and a particular interest in folklore, she writes about the evolution of feminine identity while exploring archetypal figures from different cultural mythologies. Her work has appeared in online journals Hennen’s Observer and Elephant Journal, as well as in the Corbel Stone Press anthology Nature and Mythology. When she’s not writing, she manages a tea cafe and wellness lounge in Greensboro, where she lives with her wife.